Tourism in Greater Palm Springs is our number one industry, with 1 in every 4 jobs depending on the travel industry. We owe a large amount of our continued tourism growth and success to all of those who work to make the destination’s marketing promises a reality for every visitor who stays, dines and plays in the oasis. Although the CVB honors stars in our hospitality industry each spring with the Oasis Awards, we know that exceptional acts of “above and beyond” service happen every day. These acts deserve recognition, not just one day a year, but all year long. Join us in recognizing these acts of excellence in our new “Above & Beyond” program. 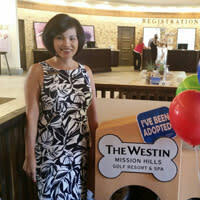 Following the Westin’s philosophy of exceeding guests’ expectations at every turn, the resort has taken the initial concept of a hotel “dog greeter” to outright “dog adoption” by instituting a Dog Samaritans Team to foster homeless dogs in the resort’s lobby, going the extra mile to enrich the lives of staff, guests and their furry pals. This dedicated team made up of a dozen associate volunteers is headed by Raquel Wood, the Executive Administrative Assistant to the General Manager, who views the dogs as not just pets, but members of the family. To date, more than 97 dogs have gone home with Westin guests who had no idea when they checked in that a new “family member” would be checking out with them. Recognize the person that went Above & Beyond. Do you know someone in the hospitality or tourism industry whose actions or initiative has truly gone above and beyond the call of duty? Use the form below to submit recognition for your Above & Beyond today.